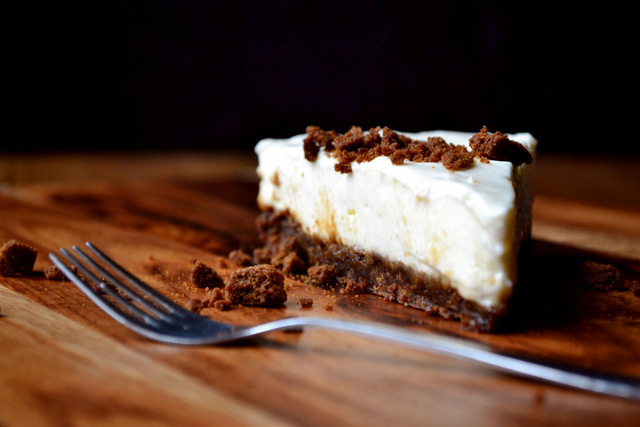 Everyone – with the possible exception of the dairy intolerant – enjoys cheesecake in at least one of its forms. Baked or set, there is something truly indulgent about cheesecake and I count it among my very favourite desserts. Since the cheese aspect of this dessert is generally very mild and unobtrusive it can be a great vehicle for almost any flavour. This rendition, for instance, brings together two types of ginger in a recipe inspired by the ever popular ginger nut biscuit. I give you the Ginger Nut Cheesecake! One problem often encountered in recipes like this is finding a way to convey the right flavour throughout the dessert. The finely minced stem ginger provides delicious and regular bursts of flavour, but it isn’t entirely consistent. However, a couple of tablespoons of stem ginger syrup – plenty of which should come with your balls of stem ginger – does the job admirably, instilling a subtle ginger flavour throughout the cheesecake. To make the most of this dessert I recommend making your own ginger nuts. After all, it takes but an hour to produce a batch of these classic biscuits and the treacle they contain makes them far superior to the shop-bought variety. Don’t slack and you’ll enjoy the decadence of this dessert very much indeed. 1. Break 11 of your ginger nuts (180g) up into coarse crumbs using a food processor or rolling pin. Gently melt your butter in a saucepan, mix in the biscuit crumbs and press firmly into the base of a 20cm springform tin. 2. In a large bowl mix together the cream cheese, crème fraîche, icing sugar, stem ginger and ginger syrup. Pour this on top of the ginger nut base, level and pop in the fridge overnight to set. 3. Once set, gently remove the cheesecake from the tin and serve with a sprinkling of your remaining biscuit. Cost: Using relatively cheap cream cheese and crème fraîche won’t impact on the quality of this dessert, but it is best to go full fat. As such, this dessert can be made for no more than about £3.50. I like cheesecake sometimes and yours looks and sounds fantastic. I love the stuff – thanks, Rosemary! I have been looking for a good cheesecake recipe. I like the sound of this one especially with the ginger biscuits but I’ve never seen the candies stem ginger here in hanoi. Do you have any ideas for an alternative? Do you have a similar thing but with galangal? You could try making candied root ginger?! Seems a shame to smash up your lovely gingernuts but it sounds absolutely delicious! Haha – I can always make more, they are very quick and easy. 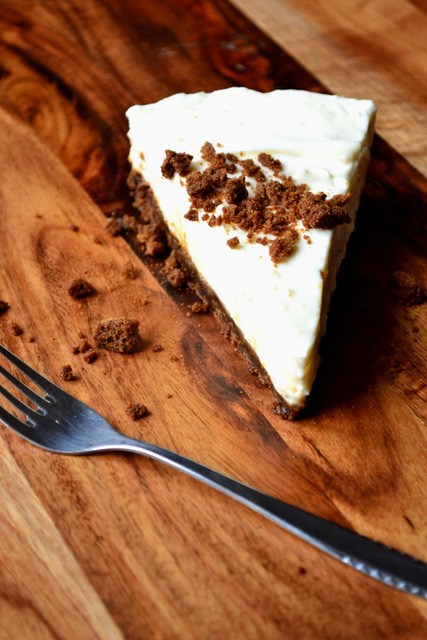 Oh wow – this is a cheesecake for grown ups….love it! Indeed it is – thanks! Cheesecake is one of my favorite desserts! Those crumbs are so enticing. Yum! 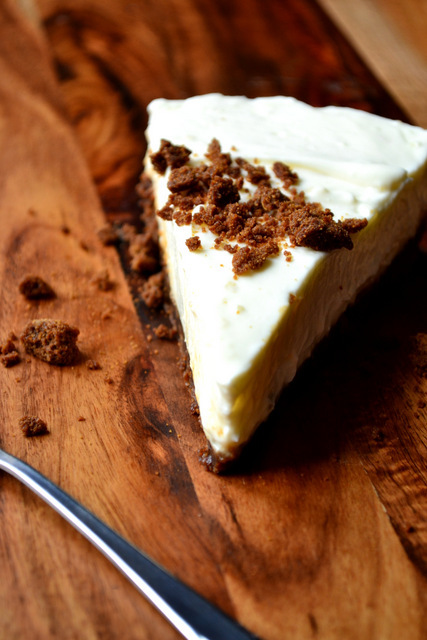 Mine too – the crunchy crumbs on top work wonders in this recipe. This recipe looks absolutely divine. Oh lord I can see the scales groaning at the thought. I’ll just tell them to blame Frugal Feeding! My hubby isn’t in to desserts so I’ll have to eat the whole thing. Made the gingersnaps yesterday and they are just the best. Perfectly crunchy any gingery. 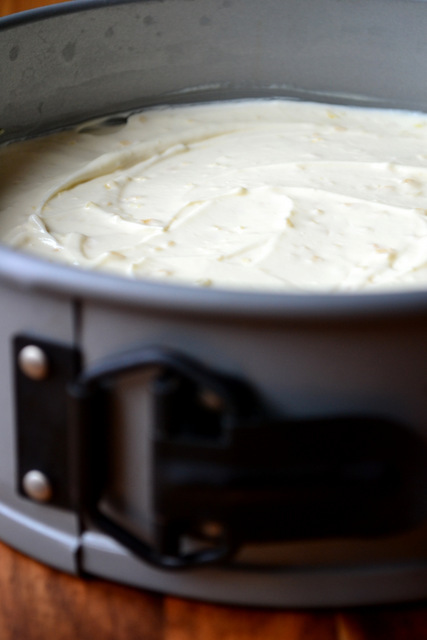 I recently made my own ginger syrup, so it’ll be lovely for this cheesecake recipe. Many thanks for all your super recipes. Thank you! It’s actually relatively light for a cheesecake. Glad you liked the ginger nuts/snaps! Oh, I do love cheesecake! I also adore ginger cookies (and all things gingery), so you have pretty much combined two of my favorite things. This cake would not be safe in my house! Great to see you here, Willow :D. Glad you like my cheesecake! Sorry you’ve had issues with the recipe! Are you sure you used the right sized tin? The recipe is exactly as I made it and the flavour was intensely ginger, it set beautifully and was the proportions as you can see them. I’m not sure what could have gone wrong!